On any given Friday during market season, follow the crowd, and you'll be led directly to Phalla - a longtime vendor of the Lowell farmers' market. A sweet woman with a contagious laugh, Phalla is a New Entry farmer who comes to us from Battambang, a western province of Cambodia. While still very young, Phalla recalls accompanying her father - the mayor of their city at the time - to his potato farm. She admits that her career in farming did not directly grow out of these early experiences, but what she knows about growing good food she learned from her father. Phalla first got involved with New Entry about five years ago, because of her father. She says while she didn't feel farming was always in her blood, it was her father who inspired her to dig deeper. After he passed, Phalla honored his legacy by continuing to farm. Being a principle farmer is hard work, but Phalla says she's lucky to have the help of immediate and extended family. “My mother is my best helper!” she says with enthusiasm. Phalla is the grower and the saleswoman, while her mother is the organizational backbone of the whole operation. Cultural food traditions are the heart of any community, and Phalla helps keep these alive by growing and selling popular Asian vegetables. Market goers crowd around her stand, drawn by the display of uncommon delights, from bitter melon to pumpkin vines to amaranth leaves. If you're looking for something adventurous, try some luffa - also called Chinese okra but very different from the variety typical to the southern United States. It takes a long time to grow, Phalla explains, but it's worth the wait. Luffa is one of Phalla's favorites, whether sautéed, put in soup, or dipped in fish sauce. 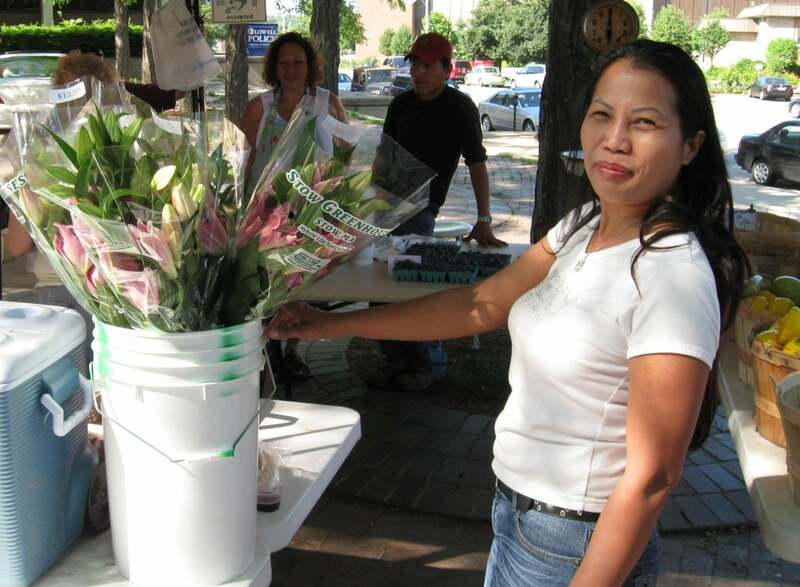 Apart from the Lowell farmers market, Phalla can be found at four other markets in the greater Boston area, and she is one of the most prolific suppliers for the World PEAS CSA. Her main product is garlic, but she grows a huge variety of other crops: cilantro, green onions, mixed let-tuce, basil, chili and habanero peppers, several eggplant varieties, tomatoes, Asian cucumber, squash, and molokhai, a bitter leafy green. When asked about the biggest challenge she faces in farming, she exclaims with a hearty laugh: “Weeding!” Although she has no concrete plans for expansion, she would consider expanding her business if she could find some extra help. She and her family manage well most of the year, but the biggest challenge comes during peak season, when harvesting and weeding compete for her attention. On top of that, Phalla says that every day is groundhog day. Groundhogs seem to have an appetite for everything on Phalla's farm apart from green onions; they even get into the green-house. This season, a good majority of her Brussels sprouts crop was lost to the hungry buggers. Next year, she intends to plant extra, just in case. While farming may slow down in the winter, Phalla doesn't indulge in an “offseason.” As a side business, you can find her making custom Chinese playing cards. With such an entrepreneurial spirit, there is no doubt that Phalla will see great successes with all her future endeavors. To view a USDA video featuring Phalla, please click here.